Fire Command Training has been conducting fire service training throughout the United States for several years and they have been booked for return engagements on numerous occasions because of the outstanding quality of their programs. 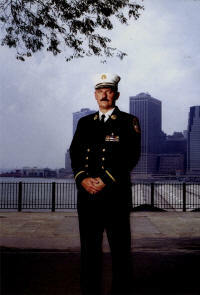 Until now, most of the programs have been conducted by FDNY Battalion Chief John Salka. Chief Salka is a nationally recognized fire training professional who has been a featured presenter at the Firehouse Expo in Baltimore, the Fire Department Instructors Conference (FDIC) in Indianapolis, the Fire Department Institute (FDNY) and the NY Firefighters Burn Center seminar Program to just name a few. Chief Salka is a contributing editor for Firehouse Magazine, and also writes articles for Fire Engineering,WNYF, and Size-up Magazines. He was also the recipient of the "2001 Training Achievement Award" at the 2001 Fire Department Instructors Conference in Indianapolis, Indiana. Fire Command now has a one-of–a-kind team of training experts from throughout the US. We have chiefs, company officers and firefighters from many departments large and small, career and volunteer that will deliver the best training that you have ever had. All of these instructors have presented at national conferences and have many years of firefighting experience to pass on to you.